"The Education Project Asia" (Chris Smith) is a consultancy designed to offer support to International Schools in S.E.Asia ... particularly in the area of integration of ICT across the curriculum. | The ICT Technician Room | ... and (for primary / K-6) a 'Topics' area. Finding schools (all schools, worldwide, not just International) is a constant challenge for parents, suppliers, teachers, students and schools themselves. There is an area on Shambles that has a list of school databases around the world .... but it can be very time consuming unless you are looking at a specific geographical area or type of school. A new addition to the internet is an application called "Rollyo" which allows you to do one search through a listed group of websites ... this can help focus the search much more than using Google or Yahoo. in this box and click "Search"
The "Chinese Mandarin Language" area on Shambles has been growing ... thanks to all those who continue to suggest links and resources. One recent addition is a new free website called "Chinese Tools" built by Olivier who is French and working in Guilin, China. 40 online lessons including reading, writing, modern vocabulary, grammar, examples and exercises. It's a funny tools to personalize a traditional chinese painting with your own chinese name on it. The first mandarin chinese / french online dictionary. Search chinese, pinyin or french expression. More than 20 000 entries. Translate your english name in Chinese and get it calligraphed. Huge searchable database. As to license, the FREE version can be freely downloaded and used in the educational setting as long as it's not used for commercial (revenue generating) or business purposes. Exploring our planet by studying maps and images is a fascinating experience! Not surprisingly, the first place many people visit is their own neighborhood. You also might want to take a look at famous places such as our National Parks or your favorite sports parks. TerraServer is also a valuable resource for researchers who was to study geography, environmental issues or archeological mysteries. Terraserver.com was founded in 1997 in Raleigh, North Carolina with the simple purpose of finding a commercial market for satellite imagery. Aerial Images, Terraserver.com's predecessor, helped seed the company's image database when it forged a relationship with SOVINFORMSPUTNIK, a Russian company with a cache of 2 meter, panchromatic satellite imagery. Virtual Earth combines mapping and local search to put the answers to your search questions in a geographical context. To do this, Virtual Earth combines MSN Search with the latest in mapping to create a new Web application built on Microsoft technology. Simply enter an address, and the system will put you at the controls of a bird's view aerial imagery to explore your digital earth. If you are teaching 'TIME" then you are guaranteed to find useful resources at this online virtual clock and watch collection. This is new listserv (mailing) list to provide a self-help group to anyone providing technical support in International Schools in S.E.Asia ... to be able to ask questions and share ideas and solutions of a technical nature. John (Patana) :"South East Asia - School (International) Computer Knowledgebase ... SEASICK"
Gavin (Harrow):"SEALIST : South East Asia - List (of) International School Technicians"
Madeleine (Patana) : "SEAnet? - SEAtech? - SeaIT? SeaBIT (like the Hanover one….different spelling) or SEAByte"
Some ICT co-ordinators have asked if it is relevant for them to join . Naace is the professional association for those who are concerned with advancing education through the appropriate use of information and communications technology. The association was established in 1984 and has become the key influential professional association for those working in ICT in Education. What do the letters 'N a a c e' stand for? Originally the letters stood for 'National Association of Advisors for Computers in Education'. However in January 2004 we merged with MAPE, a primary community, and CEG, a secondary community, so we now have a broader membership with teachers, lecturers, consultants, inspectors and other ICT leaders in our membership. We use 'Naace' to describe all of our membership - not only advisers, and not only computers! This is the term when many new students are introduced to new mice and keyboard skills ... there are lots of free resources to help in this task in these areas. Do a search on netLingo.com for "mouse" and look at all of the mouse jargon! When the pointer on your computer screen moves around wildly or irregularly, you are said to have a drunk mouse. This commonly happens when there is dirt inside the track ball area of your mouse. To check your mouse, click and hold on the |Z| shown below. Then drag the |Z| toward the |J|. If it doesn't work, you might want to clean your mouse. If you are running any courses with students which mention Google then you will find the links in this section of practical use. ... GUARANTEED or your money back ! ... and specifically for the librarians reading this (one of my favourite groups of people) ... have a look at the link that mentions the new newsletter that Google is going to send out 4 times a year ... specifically for librarians ... and sign up. 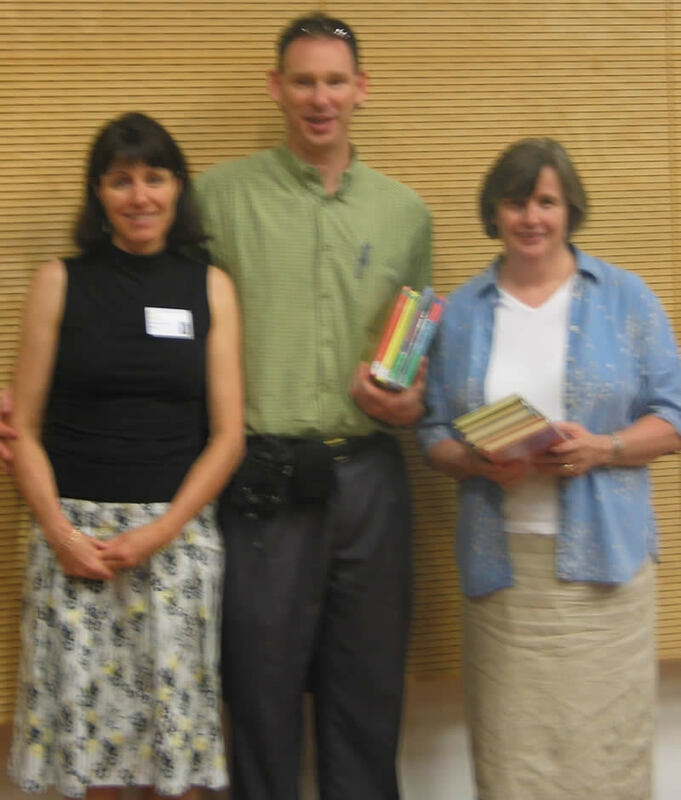 John Burrell, teacher at Bangkok Patana School, attended a TechEX 2003 Dreamweaver course and then went on to develop a site that provides support for an IB Biology course. The site combines webpages built in Dreamweaver with Flash Movies. Recent additions to the site include the use of Blogs for interactive homework and discussion pages. At its core the site systematically addresses the syllabus statements. Text is reduced when possible to a set of key points. Images and animations are used throughout the site for illustration. Quick check questions allow the student to check their understanding and the site has a 'good reading' guide and a 'short article' section. There are links to homework blogs and also to teacher feedback blogs. The site is a project in progress with much more proof reading still to take place. The next few months should see the completion of the core areas. For the 24 years from 1978 to 2002 I worked with The English Schools Foundation (a group of 16 International Schools) in Hong Kong ... most of the time as Head of the ESF Professional Teachers Centre with responsibilities for INSET (CPD) and (later) ICT. During this time I took thousands of photographs. I've now archived almost 5,000 of these images online so they hopefully serve as an historical snapshot for part of the ESF's life. Some staff may well enjoy a walk down memory lane. The archive allows you to add your own comments to each individual picture ... I'm hoping that if you recognise yourself or others in a photograph then you will add your own personal memories of that moment. This is a Flickr badge showing photos in a set called 1998 Staff INSET (miscel). Make your own badge here. You may use any of the images for your own individual private needs .... for any other uses then please contact me (Chris Smith) for details and permission. If you have any pictures yourself, in a digital format, that you would like displayed then please just send them to me with a description. http://demo.amazing-grades.com/?ID=7 : "The intelligent way to use the Internet for learning"
Amazing Grades helps students and teachers find education sites they can trust - fast and first time. It guides users to over 20,000 secure, safe, high quality web resources that have been meticulously rated, reviewed and hand picked for the value and accuracy of their content. All the resources listed on the site are classified according to learning styles, learning levels and resource type. There’s also a "Real Life" section to offer advice on studying, higher education, health, fitness and general happiness, as well as practical gap year advice. "With Amazing Grades, you only get resources relevant to the curriculum and relevant to you. It is a creative and academically rigorous way to use the power of the Internet for effective teaching and learning." Launching in November: Amazing Music – My record label. It’s a simple to use web-based system which allows musicians to share their recordings with their peers, teachers and parents. CLICK HERE to keep me updated. Coming soon: e-portfolio Amazing Me – everything I have ever done, everything I am about to achieve. CLICK HERE to keep me updated. Every time a student uses Amazing Grades they are undertaking an exercise in research and boosting their key skills in ICT. The I.B. section on Shambles at www.shambles.net/ib continues to grow ... many thanks to all who have contributed. The Council of Foundation has appointed Jeffrey R Beard as the new director general, to take the helm of the organization in 2006 after the retirement of George Walker. Mr Beard became director general designate from 1 September 2005 and will formally assume his role as director general from 1 January 2006. A list of schools who are newly authorized to offer the IB programmes can be found at this webpage. As part of the UNESCO “Strengthening ICT in Schools and SchoolNet in ASEAN Setting” project, a training session was recently provided for teachers which aimed to assist them in learning to facilitate telecollaboration (sharing knowledge through the internet) with their students, and how this enhances teaching and learning. The telecollaboration activities that are undertaken as part of the above-mentioned project are referred to under the broad title of “ASEAN Bridges of Learning”. During their training, teachers learned to use “Learning Circles”, an e-learning activity which brings together teachers and students over the internet to collaborate on investigative activities, involving the sharing of information and experiences. The telecollaboration training was followed by the first round of Learning Circles in the ASEAN (Association of South-East Asian Nations) region. Teachers and students from Indonesia, Malaysia, Myanmar, Philippines and Thailand participated in this pilot round. 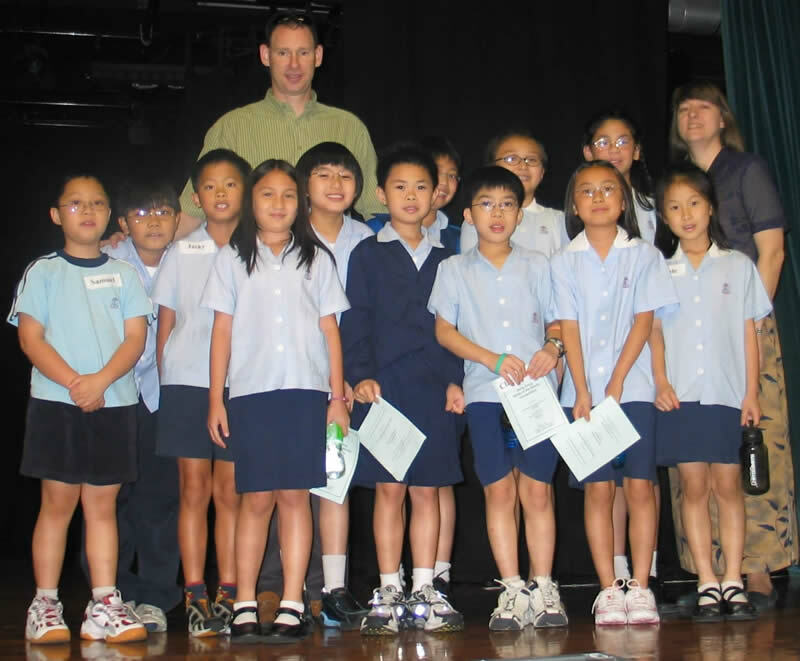 The 4th annual Hong Kong Battle of the Books championship was held at Australian International School on May 9th 2005. KGV and CAIS both retained their championships for the third year in a row at the middle and primary levels respectively. However, their stranglehold on the crown appeared to be loosening as the field of competitors grows! It is obvious that many have learned that the secret to success is to READ! Oh the difference a year can make! New schools competing last year were West Island , Shatin College , Yew Cheung, and Kellett. They joined Christian Alliance International, Australian International, German Swiss, and King George V to round out a full day of competitions. Many new schools have already expressed interest in being involved this year. ISC has launched its new comprehensive online service for mapping, analysing, targeting and contacting over 3000 English-medium international schools worldwide. Single or multiple user subscriptions are available to suppliers, service organisations and parents. The service is free to schools. The BBC's digital curriculum service is planned for launch in January 2006. It will be a free, curriculum-based, online service for 5-16 year olds, designed to stimulate learning both at home and through school, and will be particularly aimed at those least likely to succeed through more conventional educational approaches. Keep an eye on this resource .. it has the potential to be extremely useful. TechEX 2005, a forum for educators to exchange ideas, skills and experiences with others from across Thailand and the region. This is the only ICT conference in Southeast Asia specifically aimed at all teachers in international schools ... and looks like being a brilliant event. BUT the stipulation is that you must wear it sometime during the day. ! This is a 'recently revitalised' website that offers free access to all sorts of 'real' school policies (but still early days so the database is growing). This has the potential of saving educators a great deal of time ... if you have any of your own school policies that you are able to share then please consider emailing them to this site. On the front page of the Shambles website is displayed a large image which changes every time the page is refreshed or when you visit next time.